Its not the most insightful or exciting story, but I'm gonna tell it anyway. Super self-involved, but maybe there is something in here somewhere that is helpful. Maybe not. Two parts, Pubs and Organized. - I ignored @Maida's advice from awhile ago which was simply "play good tanks". - Played an old alt account. 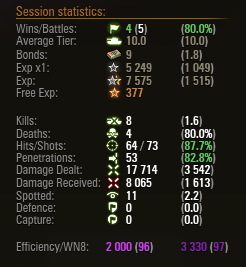 Spent some dough to play tier 8 premiums i can play a bit and free xp'd to "good" tanks only (more or less). - Played in as try-hard mode as possible. Got tired or frustrated? Stopped. Hit the Brown Water too hard? Stopped. - Tier Xs are hard to do well in (duh). "Good" mid tier tanks are easier to do well in (Duh again). I haven't played lights yet, but even more so for those who play those a lot. Everyone should look at a ton of blue player stats with a serious grain of salt. Probz a few purples as well. - No obvious practical solutions, but if we dont play organized on the regular, things will probably die on the vine eventually. - I am going to focus on Tier Xs with Juggernaut when solo. I am taking two logs off the fire on stats. Always up for a toon. The game is really no fun without toons, man. Will play anything in a toon or drops. That's it for now... hopping on in 10min. Good post. I'll toon with you whenever if I'm available. I'm usually playing 9s or 10s. One thing you didn't mention that Maida jokes about often, but I think is a good mantra for WoT..."winning is luck". I have noticed now that my play is very restricted that when I do play, I seem to do better as Im more focussed. My recent stats have been a very pleasant surprise (around 60% wr on the tanks I've been focussed on) Im playing less on the whole, not grinding endless games on the same tanks back to back to back and appear to be doing better. thanks xperminet... and good point Kilowatt... one other thing just came to mind. I've stopped trying to dictate course of battle in pubs... wayyy more "adjust according to what others are doing"... before it was like I was trying to do an even worse job of sorta calling in pubs (I know... not too bright). Lots of this is just super obvious... but you lose your way after playing tooooo many battles sometimes. This is an interesting thing. I've said this before: I have a huge problem transitioning back and forth between pubs and team stuff. They are two different games. After playing a bunch of team stuff, my instincts get programmed, and it takes a long time for me to shake it off. In a pub, I'll see 3 tanks against our 6 and will just yolo in like it is a team battle -- and no one will follow. It takes a bunch of pub matches for me to get the patience back and play like it is 1 vs. 29. Thanks Vikinger! I took off like 12 whole days! Well. Sorta took off. It was a good re-boot. So far anyway. I find that playing slightly angry helps focus. Playing on full tilt like I was before does not help, at all. Xtc - yeah, as dumb as this sounds, I think I honestly lost the “1 vs 29” perspective. Man, things are just much better if you fully embrace that perspective in pubs. I don’t think I really knew what that meant before. I think I do now. A fast learner, this one is not.